This study is the second phase (Phase 2) of an ongoing research project to improve understanding about the rise in conflict associated with mining operations around the world, particularly in developing countries. 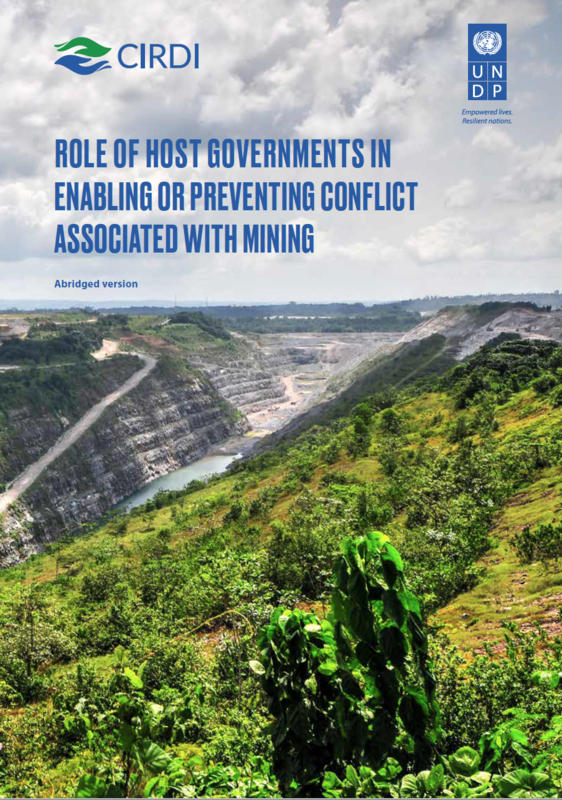 This is an abridged version of the full-length Phase 2 report on The Role of Host Governments in Enabling or Preventing Conflict Associated with Mining, published by UNDP and Canadian Institute for Resource Development (CIRDI). This publication includes summaries of a literature review, a quantitative analysis of a global database on conflict incidents, a field case study conducted in Ghana and a discussion on policy implications for governments. It also draws upon four field case studies from Phase 1 of this research, conducted by Andrews et al. (2016), which investigate specific conflict incidents at mine sites in Tanzania, Madagascar, Peru, and Bolivia. The purpose of the Phase 2 research is to better understand the role of host governments in conflict creation or prevention, and on this basis to provide possible actions for governments to consider conflict transformation, mitigation and prevention. Using a conflict pathway analytical framework, this publication focuses on a set of policy implications of interest to host governments in mineral producing countries. This work finds that with appropriate attention to the establishment of strategic approaches to mineral development, including an incremental approach to attracting the large-scale mining (LSM) sector to match governance capacity, strengthening local governance institutions, preparing rural communities for the arrival of the large-scale mining industry, reconciling the artisanal and small-scale mining (ASM) and LSM sectors, and maintaining a strong regulatory compliance and social development presence in rural mining districts, the negative consequences of destructive conflict can be avoided and a path towards sustainable mineral development established and maintained.